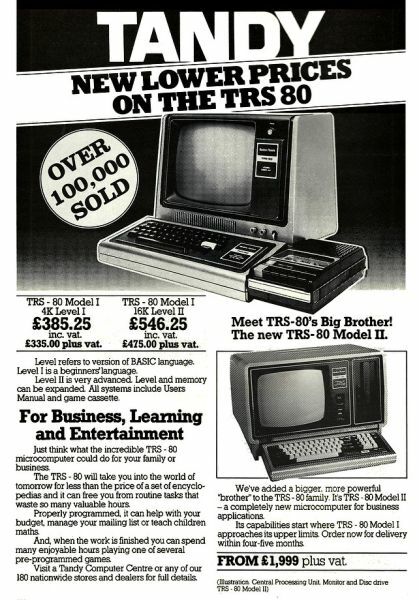 Was the TRS-80 Model 1 ever actually sold new with that name? Tandy never actually gave the original an official, distinguishing name. I have searched, and have not been able to find an authoritative answer. Some sites use Arabic, some Roman numerals. If there was a distinguishing name given, would someone please post a picture of the box with that name, or perhaps an official Tandy advertisement using that name? (Without a picture, it didn't happen! 😉) A link would be useful as well. I've gathered some pictures. Here is an early USA advert. Note that it is never referred to as a "Model 1" or "Model I". 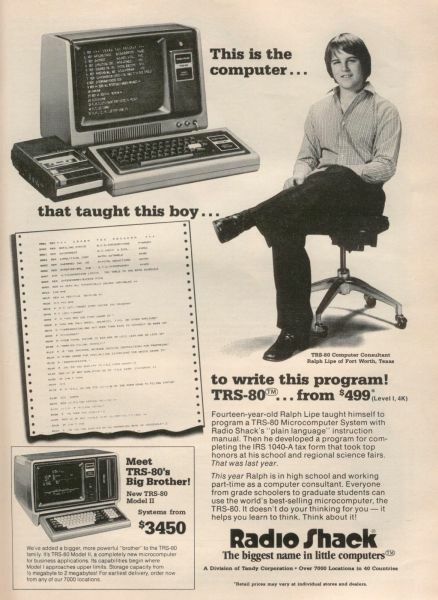 It's just a "TRS-80". Here is a later USA ad, after the Model II was released. Here is a later ad from the UK. It also came after the Model II was released. Both the Model I and Model II names are specifically called out, in addition to the two Model I systems for Level I BASIC and Level II BASIC. Tentatively these ads indicate that the original machine was publicly referred to as the "Model I" in the UK. The catalog Raffzahn mentions is for the USA (I looked it up), so at least in brochures, Tandy would refer to the "Model I" after the Model II came out. The middle image suggests Tandy did not feel it necessary to use the Model I designater in USA ads. I did browse some of my racks and found that thruout all Tandy Computer Catalogues, starting with RCS-3 in 1979 the original TRS-80 was called TRS-80 Model I (Roman Numeral). But in original Tandy manuals and documentations I did find many spellings as TRS-80 Model 1. So it seams as if they did keep the Model I seplling thruout all advertisement, but not over all. Similar BTW for the early distinction between Level 1/2 and I/II BASIC. Not the answer you're looking for? Browse other questions tagged trs-80 or ask your own question. 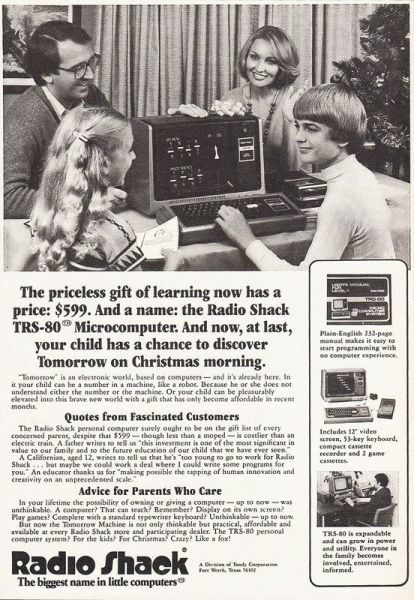 Did Radio Shack initially attempt to get a monopoly on commercial software for the TRS-80 Model I? Who coined the nickname “Trash-80” and what was the source of their animosity? Expanded Ram Options for the TRS-80 Model 100 possible into the megabyte range? How to use the MOD operator in TRS-80 model 100 BASIC?